The Micro Balance bike is manufactured by Micro Scooters Ltd, who are most well known for their fantastic range of scooters. However they also provide an excellent balance bike as part of their range as well. The Micro Balance bike is designed in Switzerland and with a clean and simple design it looks great and really stands out from most other balance bikes. The frame consists of lightweight aluminium, and is available in a choice of either orange or purple. The bike is advertised as being suitable for children aged 2-5, although with an adjustable saddle height between 36 – 42cm this means that it may be slightly too large for an average 2 year old. If you are looking for balance bikes for 2 year olds then check out our recommendations here – these bikes include models such as the Puky LRM Learner bike which has a saddle height starting at just 29cm. 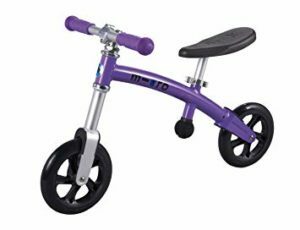 However, if your child is the right height for the Micro Balance bike then they will enjoy the range of features which include a lightweight frame, adjustable handlebars (with a thick rubber bumper to protect little hands) and mark free wheels, which makes the bike ideal for both indoor and outdoor use. The bike weighs in at just 3.2kg, which is one of the lightest on the market and makes it easy to carry and transport. The Micro balance bike is quick and nimble, so once the rider has mastered the art of balance and steering they will be racing away enjoying their freedom. It is beautifully designed, with a smooth and flat fork, no exposed bolts and a comfortable foam seat which gives bike a slick and stylish look. One point to note is that although the solid wheels are great for indoor use or on paved surfaces, the solid wheels of the Micro balance bike provide very little cushioning, and the small diameter wheels would make it difficult to ride the bike on non-paved surfaces. If you are looking for a more BMX style balance bike, then try the Chillafish BMXie balance bike which is much more suitable for getting off the beaten track. The Micro balance bike has a quality build, as would be expected from such a market leading company so this bike will retain its value and be able to be handed down through the family or to friends. The Micro balance bike is priced in the more expensive part of the balance bike market at around £130, but the lightweight and quality build nature of the bike justify this cost and it is a quality bike for indoor use or getting around towns and villages.